Find out which Starfy avatar we voted as the best in show! Well the time has come to announce the winner of "The Legendary Starfy Avatar Contest" we recently held. We want to first thank everyone for the overwhelming response to the contest. I don't think any of us actually thought we'd see this many unique avatar entries into the contest. We ended up with 46 individual avatar creations. To say that we had a tough time narrowing these down to 10 would be an understatement, but ultimately choosing one was almost impossible. Below are our top ten picks, along with the overall #1 winner RacoonMario. 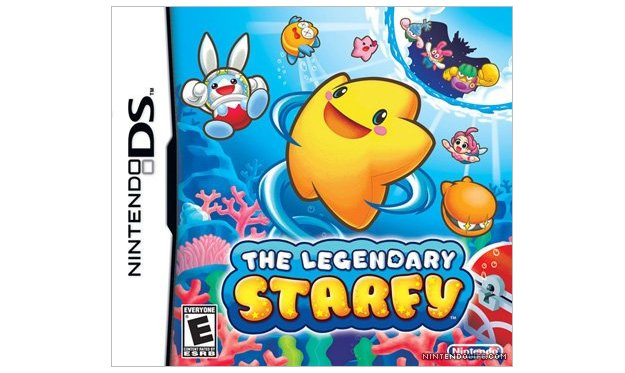 The winner has just been notified and will receive their copy of The Legendary Starfy in the mail soon. We hope you enjoy it! Again we want to thank everyone who participated in the contest. We thoroughly enjoyed the fun and originality many of the avatars featured and we'll likely be holding another avatar contest at some point in the future because of it. Congrats guys! Although I'm really surprised to see Objection_Blaster and pixelman get mentioned. theblackdragon definitely deserved higher, anthonyb is about where I thought he'd be, Cheesy deserves #2 spot, accc I knew would get in too. Yayz to those that got in the Top 10! lol, 'grats, RacoonMario! And thank you, NL; this was a lot of fun. Wasn't even in the top ten? Bawww. Congrats though Raccoon and everyone else as well! Guess it's time to revert back to normal. I know. I really expected you would be in the top 3. It looks like you put a lot of effort into yours. We had a hell of a time picking these. No one could hardly agree on the same ones. Sheesh. I need a nap. But thanks to everyone for all the great avatars. Aww well, maybe next time. Congrats RM! So us runner-ups get your starfy schwag, right? Shocked The Hoff took 4th lol. Just for curiosity's sake, mind telling me what I came to in the end? @Gamer1030: I wanted to see you in too. you should've replaced Objection_Blaster for sure. @theblackdragon: I really wanted to see you get in the Top 5. You deserved it. And yeah, this was a great contest. Guys DEFINITELY gotta have more contests like these. Oh yeah, and the irony of it all: the last minute entry ended up winning. lol. Yeah Congrats Racconmario. Now if you excuse me, I'm going to go cry in the corner... lol. Gamer1030, you actually came in at #13 on the overall. You were eliminated in the last cut down. @KnucklesSonic8: thanks, but it's no big deal; i'll just buy the game myself :3 definitely surprised Toddr didn't place, though... i guess it didn't translate so well when cropped down to size. @Corbie: Did I get in the Top 20? Wow! I got 9th! And Raccoon, you rock. @KnuckleheadSonic8: Harsh. Cold. Evil. Rawr. I have to say that ChickenBrutus got robbed to not be in the top 10 with his Obama-poster parody, which was spot-on and an idea I wish I'd thought of. Also, you have to show the Raccoon winning one in its small form -- the whole contest was a matter of staying within 60 pixels, that big version is irrelevant. Congratulations,RacoonMario! Corbie,what place was I in? I'm going to post the official count we logged at 1-20 in a few minutes, if I can find it. I hope I at least made it into the top 20. It looks like I'll buy Starfy at GameStop tomorrow. Oh,and congratlations to BlackDragon making it in the top 10! @warioswoods: Indeed. If I had bigger dimensions I could've done a different idea. "I have to say that ChickenBrutus got robbed to not be in the top 10 with his Obama-poster parody, which was spot-on and an idea I wish I'd thought of." Yeah, he deserved more, even if he was a bit cocky. The tingle one had more lol value, while the Obama one was more powerful. @Corbie: Oh btw, do the top 10's get anything cool? Like admin access for a day? Awesome Racoon.....And my lol bro (ToKool2007) made tenth, thats awesome. Great job everybody. @Racoon....I wish I could get Stafi to have Uzis in my games that would be really fun. @pixelman: I'm sorry but I'm just saying it like it is. Mostly added a tennis ball and a racquet meanwhile some I wanted to see in the Top 10 for a mention went all out and had some very unique creations. And I knew that whole "knucklehead" bit was comin'. ha, i just checked, and RacoonMario made that submission a mere 4 minutes before Corbie officially cut the entries off. you're lucky you made it, dude! @Blackdragon....your avatar was really creative and I thought you would either win or be second. My lil bro was explaining the avatar and I was like that has to be BlackDragons lol. @Valerhu Do you mean the pink starfy/starly, or the IMA CHARGIN' MA LAZER! guy? Oh dear where was mine at Corbie? Was my avatar that bad!? @ TheBlackDragon Yeah, I was kind of worried about how hard it would be to see when it was so small. @VALERHU: As do I! Wow. @SuperSonic1990: Well it's not so much that it was bad but maybe it was because you stole it (lol) whilst many others came up with unique creations... for the most part. I loved all of them. And there wasn't a "bad" one in the bunch. As I said, we had a tough time even narrowing it to 20, let alone 10 and then 1. @ VALERHU Do you think Corbie realizes you weren't even allowed to enter? I've been keeping my family updated about it, now we're all really excited, and celebrating with cake!! This is really awesome, I've never really won anything like this before, thanks again guys! No big deal,I think I will pay Gamestop a visit tomorrow. Don't feel bad, my avatar was mocked and didn't even make anyone's top 20. @Toddr: i'd imagine if she'd indeed made first place in the contest, they would've figured it out once she gave them her mailing address. Hm, I feel the judges must have been looking at the uploaded files rather than the resulting avatars, as I can't make heads or tails of what is going on in #7 and #10, even if I zoom in; not enough detail in that 60x60 pixel square. I saw some very nice ones that used the actual space well -- and, once again -- how on earth was Chicken Brutus's entry not even in the top 20 ?? Out of the top 10 here, I'd pick #4 or #5. But everyone's different ideas were fun to look through. By the way,congratlations KnucklesSonic8 on making it into the top 20! This contest is a really great gig....dont think Ive ever seen a site do anything like this. NL really is freakin #1 in my book for sure now. Yes, we must do another one some time! I don't understand. I thought mine was in first place? I feel like I've been lied to. But seriously, congrats to the winners. They all look awesome, and there are a bunch of other good ones, too. I really like this type of contest, despite making the forum a bit confusing to read. Nintendo would probably appreciate this type of promotion, too. I just enjoyed seeing all the starfy avatars running around the place today. Great job everyone. Chicken Brutus contributes to the site. He was technically ineligible. LOL...Later on guys. Great job Racoon (dont eat to much cake lol) gota go work through more Mario and Luigi so I can get into my copy of Starfy. @Corbie: I didnt know that one either. I like yours, very clean and visually is a good, crisp-looking fit for the limited space alloted. I would have put you higher than #17. I can't believe I didn't even break the top 20. Rigged I tell you! Rigged! Wow I can't believed I finished third! Congrats Raccoon Mario and thank you NintendoLife for holding this contest! Accc, by the ways, my sister and I both agree that your "The Starfy of David" is pure awesome. We'll definitely do more avatar contests in the future. After seeing the high quality of these submitted, we have to. This greatly exceeded any of our expectations as far as quality and quantity. You guys deserve congrats. Maybe next time we can offer up more prizes to give more people a chance. Great job to everyone! This was a lot of fun! There were some really creative avatars- I laugh every time I see Rabbi Starfy hahaha! @ Corbie. Will it be rigged next time? Yes, I can promise you we'll keep it rigged. @Corbie: Yes, you MUST! Uhh.. that is, do more contests, not rig it; lol. This was a great little shindig you guys pulled off and honestly more contests in general would be awesome. @Corbie. Can it be rigged in my favour? I only win things when I have an unfair advantage. @Corbs 4th place wins your shirt? Corbie,next time you must rigged it just for me!! Yes, next time we'll swing the contest in your favour more. In fact, we'll make nearly impossible for anyone else to win. In fact, you win now. We won't even bother with the future contest. Congrats!!! Congratulations RaccoonMario!!! A Winner Is You!!! Great job everybody, you are all winners in my book! @Corbie-LOL. 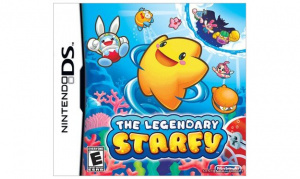 Regardless,I think I'll buy Starfy tomorrow. When is the review going to be up? @ Finalkingdom13 - Many thought your avatar looked badly burned from the waste down. And the Starfy review should be finished up tomorrow. Aww, nothing for 2nd and 3rd place? Come on, at least a T-Shirt? haha anyways, good job, guys. Glad I'm 2nd, though I never won anything in my life before =[ lol I'm such a loser. Oh wow~! I got 11th place! This totally makes my day! Great job everyone! Yeah Cheesy, yours almost won. You were 4 minutes away from victory. Congratz to the winner! I didn't think I'd win against such great competition and placing at #6 is really cool. @knucklessonic8-It is in REALLY bad taste to knock people's submissions. I don't appreciate it. Remember, it's not necessarily how much work it took, it's if it caught the judges' eyes. Im guessing I was last, wasnt I Corbie? GabeGreens, I'm just not sure. We narrowed down to 20 right off and didn't chart anymore once we reached the final 20. Then we began narrowing down further and further until we reached 10 and then finally the #1 pick. Don't get down, next time you could be the winner. Damn it, why not 8 EST? I would've won for the first time haha. Anyways, congrats again. Hope there are more contests like these, Corbie. They're awesome! @Corbie, so how much is it so I COULD be the winner eh, if u know what I mean. I already bought the game on Monday, so there wasn't much point trying to enter (if I could've even figured out how to make an avatar in the first place ). Personally, I like Objection_Blaster's a lot because it integrates his persona so well. He could keep using it for a while and it'd still be easy to recognize him! I recognize people by avatar more easily than name, so today has been very confusing with so many unfamiliar avatars floating around. Edit: Also, Corbie's was pretty good for the same reason, even if the scythe does look TOTALLY wrong in Old Man Lobster's claw. @GabeGreens No, I was last. Mine was unfinished so I decided not to submit it. I think that was what I liked about Objection's avatar. Although it was Starfy-related, you could still quickly tell with a quick glance that it was his avatar. As for mine, yeah the Scythe did look a bit weird in the lobster's hand. But what are you gonna do? @Corbie which one was your personal favorite? Well, it was worth a shot. Congratulations everyone! no, what were youre 7 personal favorites? Actually my pick ultimately pushed through, possibly why some of my other picks didn't fare as well. It was sort of a "pick your battles" type atmosphere as far as my input. But there were a bunch I really liked. My cutdown to 20 was the toughest for me. So which picks didnt fare as well? anthonyb's sawblade Starfy was one I really liked, but it was deemed ineligible because it wasn't set as his avatar. I changed it, but he changed it back, so it was tossed out. I also like yours and mastersworddude's avatars as well. In truth, there were a bunch I wanted to make the cut that didn't. And narrowing down to 10 was not too bad, but going to pick the final one wasn't a picnic. There was a Starfy avatar contest? DAMN I wish I knew about that earlier! Oh, and I think Sirgrim should've won. David Hasselhoff! EDIT: Why is everyone's text in bold? im going to participate next time around!! my avatar building skillz aren't quite that hot yet. very awesome of nintendo life to give us a contest to win something. Congrats to RacoonMario. I was hoping to at least make the top 20, but something as understated as my avatar will either capture a person's attention or get overlooked entirely - depending on taste - so I understand. I definitely hope we have more contests like this in the future. Hey, Corbie! I was just browsing my Facebook friends list, and I noticed you still have separate links for WiiWareWorld and VC-Reviews. You meant it when you said you don't update it much, didn't you? Yes, this is totally off-topic. Just trying to post somewhere I think you'll see this. Umm...sooo...on-topic-ish, where did the idea for this contest come from anyway? Sorry if that was said when it was announced, but I don't recall hearing...just curious! I'ma go play some Starfy now. World 5, here I come! We've held quite a few contests for European gamers, but we've had a few complaints about not letting the NA gamers in on the fun. We got an extra Starfy release so I came up with the idea of the avatar contest. If I had known it would generate so much buzz, I would have made it a longer deal. As for Facebook, I never even go to it hardly. I'm a terrible Facebook and MySpace user. TERRIBLE! I just don't have much time with working on this site. Takes up a lot of my time. What a great contest! Watching all those Starfy avatars was a lot of fun (thou a bit confusing ). Even if I can't enter, I believe these contests are a great idea, keep them coming. Thank you! it was my first time using GIMP, so i didn't think it would come out well. Congrats to the winner, and the runners-up. ACCC was probably my favorite, to be honest. But Corbie, there's a typo in this article. You put "RacoonMario" as the winner, but it should be spelled "Chicken Brutus." Also you used the wrong icon to represent me...mine is the Obama one! Otherwise it's fine. Thanks to those with kind comments for ym submission. I knew I had to incorporate some of my "persona" into it. That way, I could keep it after the contest, which I plan to do until the next contest! Can't resist since he heard the P word: "Per...so...na~!" So that's why there were so many Starfy avatars. I completely missed the announcement of the contest, so I got completely confused why many people had Starfy for their avatar. Congrats, Racoon Mario, and hopefully I get the memo that there is a contest. These avatars are awesome! "anthonyb's sawblade Starfy was one I really liked, but it was deemed ineligible because it wasn't set as his avatar." Aww dang it!!!! Poo, I should've entered that one then! Well I feel honored anyway- thanks Corbie! I should've taken the hint haha! I just can't believe that I came in seventh place! Even though I don't get anything, it's nice that I'm in the Top 10! Hey Corbie, how many people actually like mine? Of course I wasnt going to win. Congrats Raccoon Mario! I didn't compete, but (no offense) Cheesy, you're pic was a little cheesy. I didn't like the RacoonMario Starfy™ with the gun. That was unneeded.